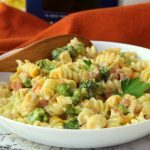 Ham & Broccoli Bake – A cheesy, flavorful pasta bake made with ham, broccoli and rotini enveloped in a rich, delicious Alfredo sauce. An easy, quick dish for busy weeknights that the entire family will love! With school right around the corner and the weather starting to cool down, I’ve begun making friends with my oven again. 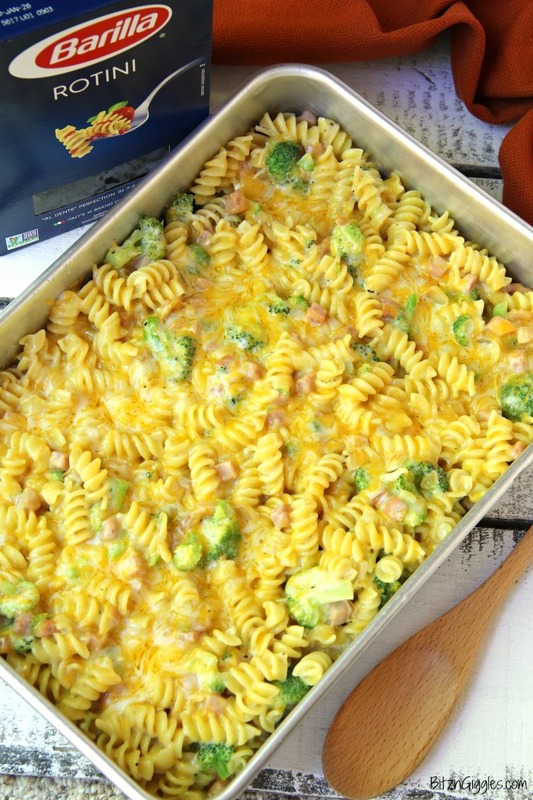 I’ll admit it, while we’ve given our grill a workout this summer, I’m ready to start transitioning back over to indoor-cooking and preparing dishes like this Ham & Broccoli Bake. This bake comes together with simple ingredients, and is perfect served alongside a salad with fresh greens. 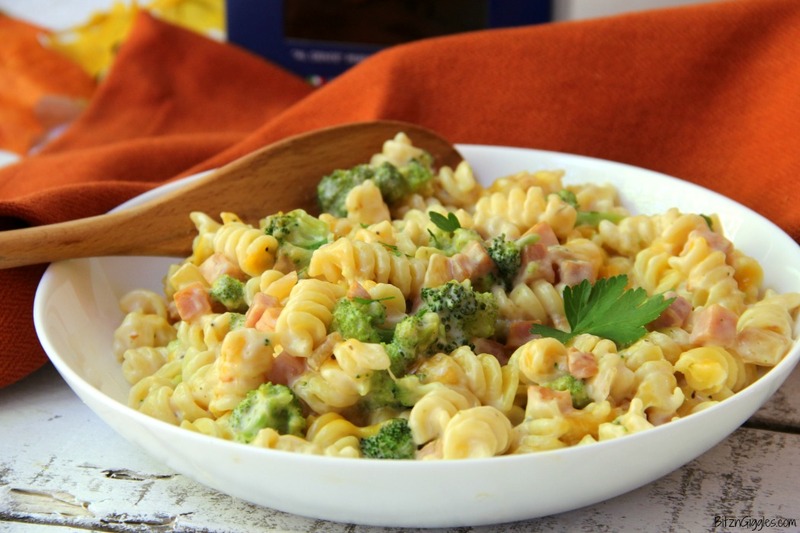 Combined with the ham, broccoli and cheese, the Alfredo sauce really makes the dish so flavorful! I usually have everything I need for this bake on-hand, either in the pantry or the fridge. The first time I served this to my family, my husband loved it. He suggested that next time we substitute the ham with cooked chicken pieces. So, I want you to know I have made this with chicken pieces as well. We went right back to the ham. The chicken just wasn’t as flavorful. Personally, I think the ham adds a bit of saltiness that’s needed in the dish. I suppose if you did use chicken you could just season the chicken with a touch of salt or your favorite seasoning. Whether you choose cooked ham or chicken, the bake only takes about 15-20 minutes in the oven. You’ll know it’s done when the cheese on top is melted. Grab a spoon and get ready to dig in! The entire family is going to love this dish and it’s the perfect solution for busy weeknights. . .or even lazy weekends. 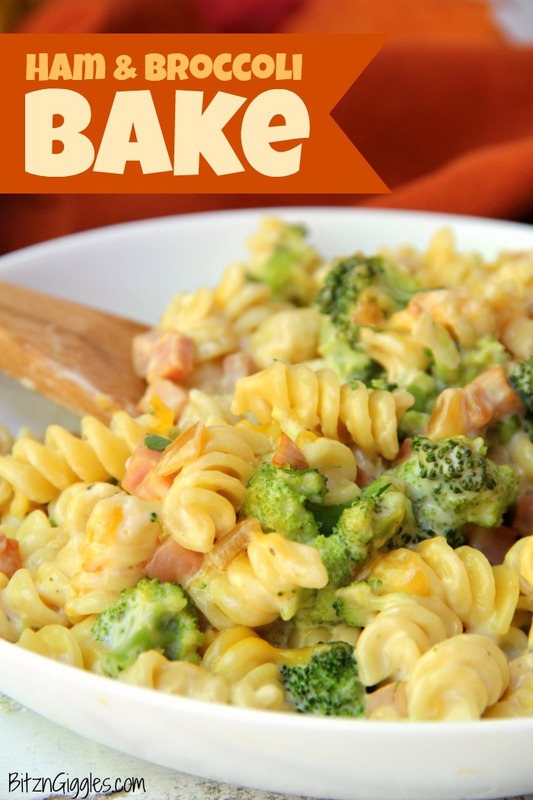 I can’t wait you to try this flavorful bake! 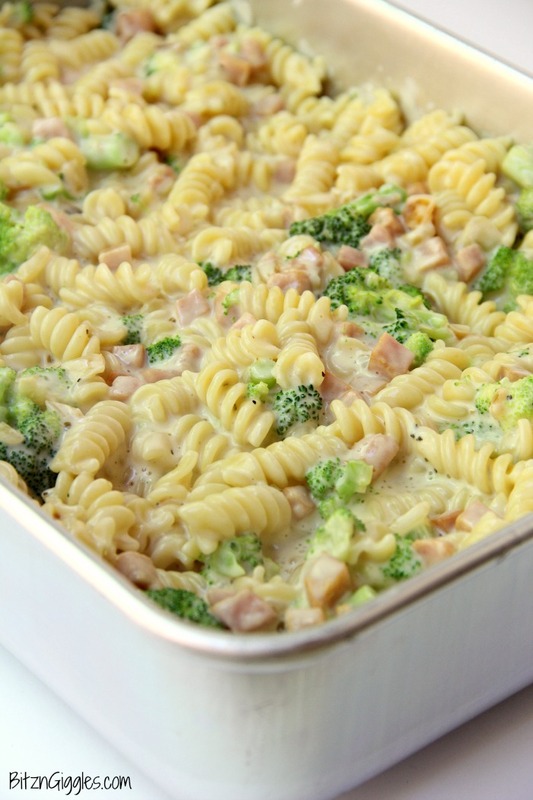 A cheesy, flavorful pasta bake made with ham, broccoli and rotini enveloped in a rich, delicious Alfredo sauce. An easy, quick dish for busy weeknights that the entire family will love! Bring a large pot of water to a boil; add rotini and salt; boil for about 10 minutes. Drain. 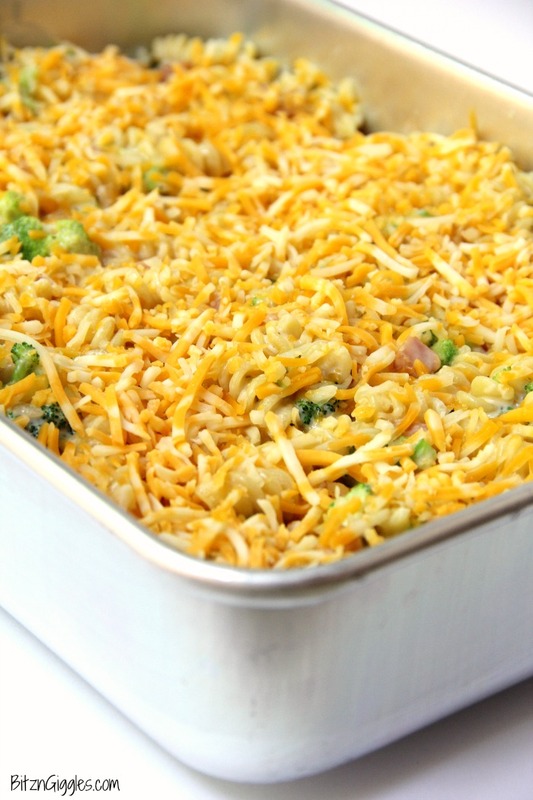 Place the broccoli in a microwave-safe dish and add add 2 tablespoons water. Cover and microwave on HIGH for 2 minutes. Chop broccoli up into smaller pieces. Heat olive oil in a large skillet over medium heat; stir in the diced ham, onion and Italian seasoning and cook for 5-8 minutes. 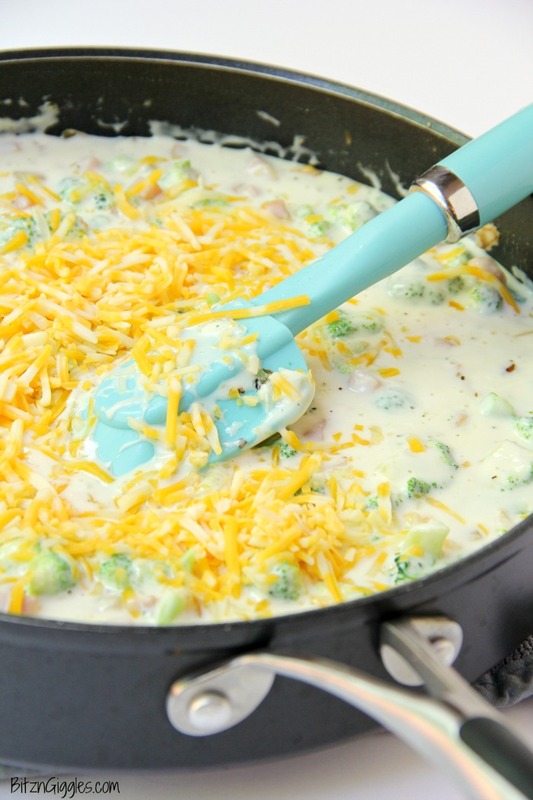 Stir in the broccoli, Alfredo sauce and milk. Stir. Add 1 cup shredded cheese. Bring sauce to a simmer. Transfer the mixture to a 9×13″ baking dish. Sprinkle pepper over top of dish. Top with remaining cup shredded cheese. Bake for 15-20 minutes or until cheese on top is melted. Quick tip: If you don’t have 15-20 minutes to wait for the dish to bake, go ahead and skip the baking step. Instead, add 1/2 cup more cheese to the skillet and sprinkle the rest of the cheese on individual servings once the pasta is plated.